Who doesn't love amma's home-made food? Yes, me too, I really miss my home. We may not be given much importance to our mom's food when we were young and living with them. But once we moved out and started food preparation by ourselves, We badly will realize the truth and how desperately we crave for amma's food. I was not that much interested in cooking before my marriage, because my mom is a pretty good cook and she used to make spicy fish curries and other delicious traditional Kerala dishes for me and my brother. But after marriage, everything has changed, I moved with my husband to Chennai (He was working there) , miles away from our families, each and every moment filled the emptiness in my mind, yes, I missed Kerala, my home, my family, everything... I believe each and every event happening in our life which may be painful and unbearable, will bring ultimate everlasting happiness. As Gita says everything happening for the best. So enjoy the changes, enjoy each and every moment in life. Soak tamarind in 1/4 cups water and take the juice out of it. Heat 3 tablespoon of oil in a pan. Saute grated coconut till brown. 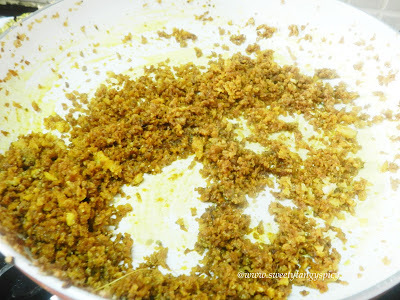 Add coriander powder, chili powder and turmeric powder and mix well. Grind into fine paste when cool down. 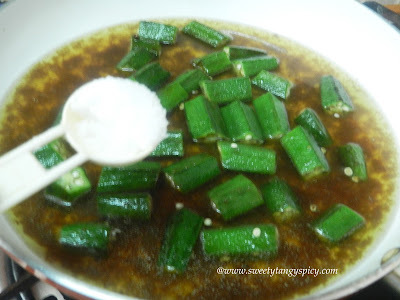 Heat 1 tablespoon oil in a pan, add chopped ladyfinger and saute for few minutes till they turn soft. Add 1 1/2 cup of water, tamarind juice and salt. Cook covered on medium flame, till the ladyfinger turns soft and gravy reduced a bit. Add the ground coconut paste and mix well. 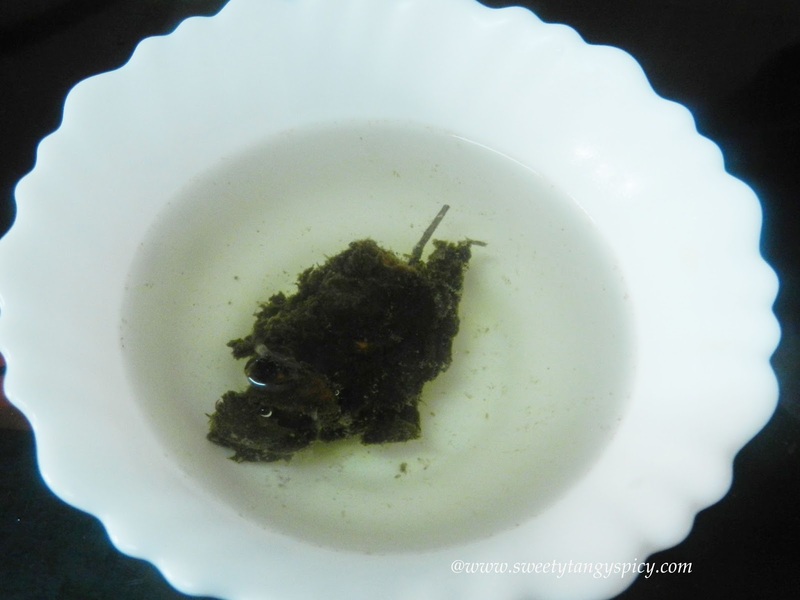 Soak a small gooseberry sized ball of tamarind in 1/2 cup of hot water 10 to 15 minutes before cooking. 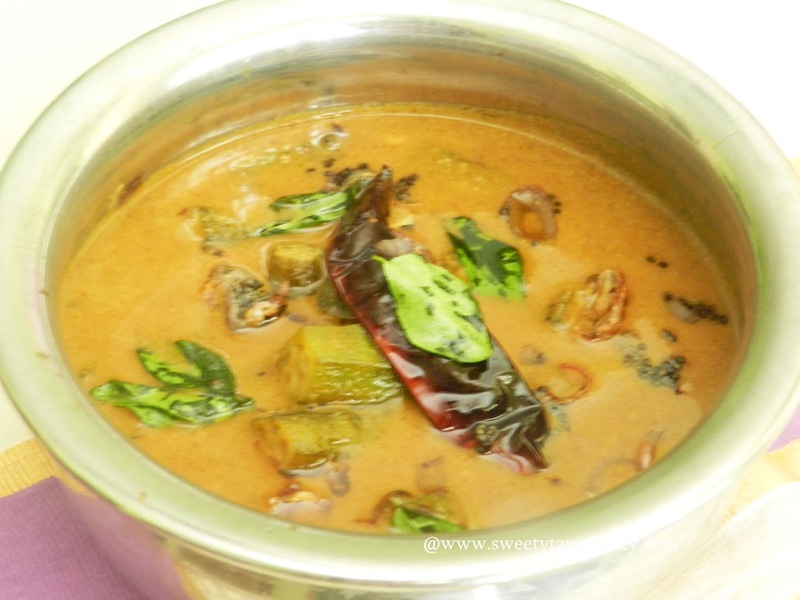 Heat oil in a pan and roast 1 cup grated coconut till golden brown and add 1 teaspoon chili powder, 2 teaspoon coriander powder and 1/4 teaspoon turmeric powder, mix immediately. Make fine paste when cool down. For more details, please check my post: Roasted coconut paste or thenga varutharachathu. Heat 2 tablespoon oil in another pan and saute ladyfinger for two to three minutes on medium flame till softens. (Both ends of ladyfingers are trimmed and chopped into two. 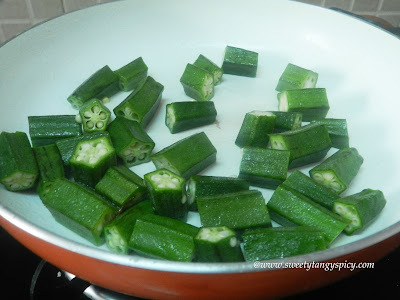 I used small ladyfingers, so I chopped into two pieces. Make 2" sized pieces). The next step is cooking the ladyfingers in tamarind water. Pour tamarind juice, 1 1/2 cup water and salt. Let it boil on high flame. 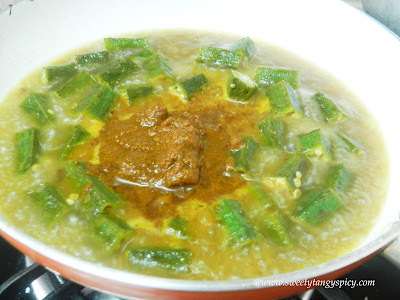 Cook covered, then reduce the flame to medium and cook till the ladyfingers are cooked completely. Do not overcook, should retain its shape. Add more water if you want, give a boil. 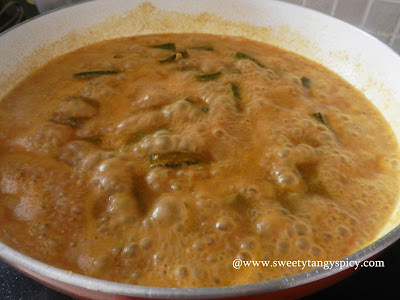 Then add the roasted coconut paste or thenga varutharachathu and mix well. Cover with a lid and boil till the gravy thickens. You can take it from semi-thick to thick consistency. If you don't have gravy, just loosen it because it is very delicious in all the three forms. 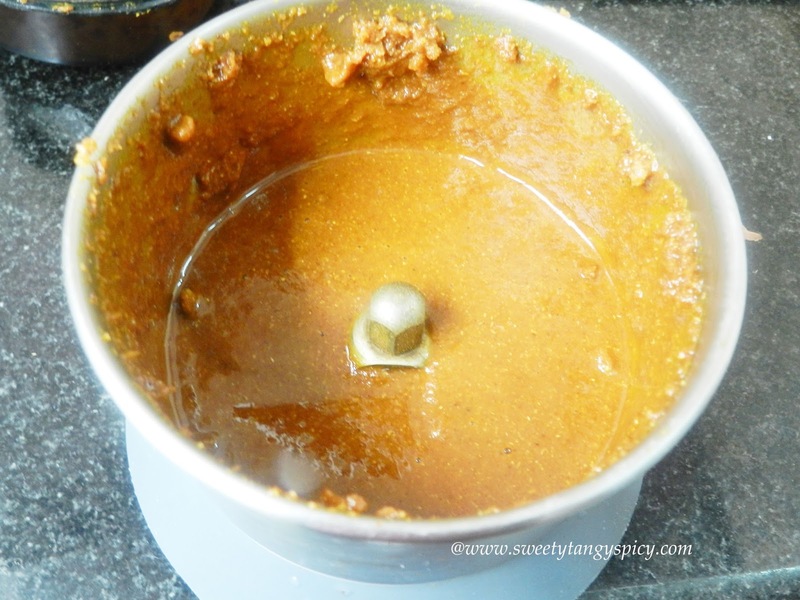 Once the gravy attains required consistency, switch off the flame. Now we will prepare seasoning. 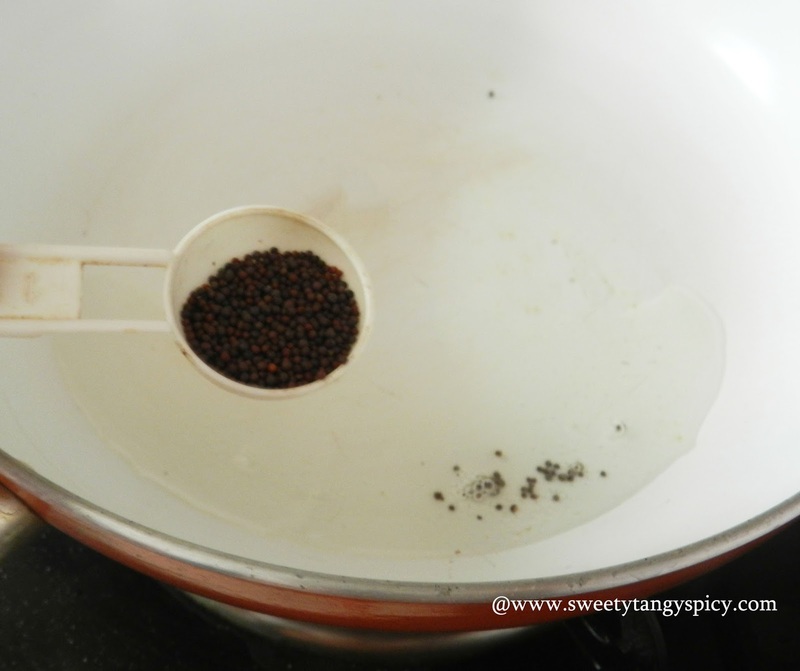 Crackle mustard seeds in 2 tablespoon oil. 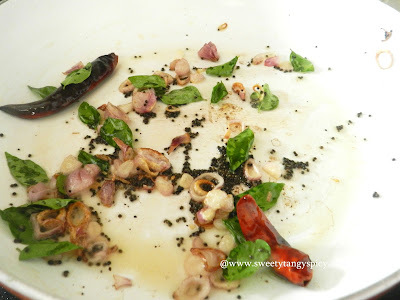 Saute red chilies, shallots and curry leaves, until the shallots turns crispy or golden brown. Pour this over the curry and serve with rice, dosa, chapati etc. Amount of tamarind used depends on its strength, please do a taste test before proceeding. Add more if needed. Take care while roasting coconut, cook on medium flame and immediately transfer into the mixer grinder once it is ready. Otherwise, will burn due to the heat of the pan. If you feel any difficulty in grinding roasted coconut, add one or two tablespoon oil (not water) and grind again. 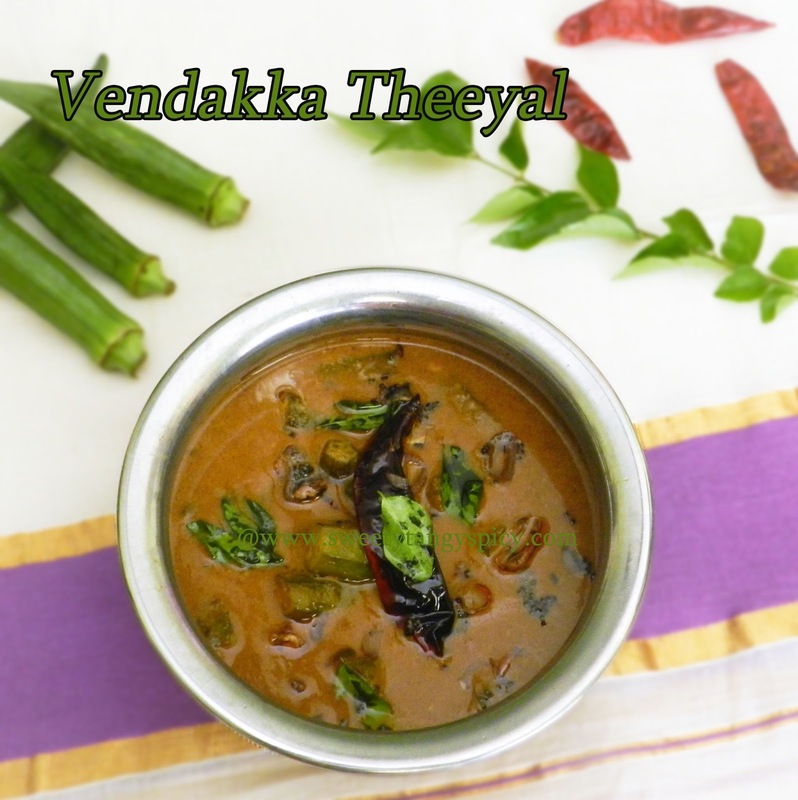 Usually, theeyal has a semi-thick consistency. If you like, you can make it a loose gravy also. 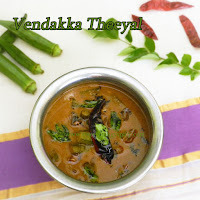 In that case, add 1 more cup of water while cooking ladyfinger in tamarind juice before adding the roasted coconut paste (thenga varutharachathu).